Manufacturers of tension control systems for process control of printing, coating, laminating, spliting/slicing in Film, Paper & Foil converting industries. These systems consist of magnetic (power) particle brakes & clutches, auto or manual tension controllers, loadcells, imported pneumatic brakes & clutches. 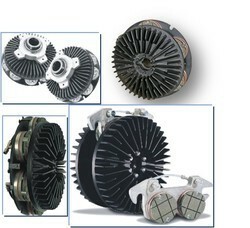 The ratings available from 0.6kgm to 40kgm in brakes & clutches. 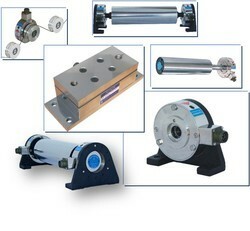 Ratings of loadcells are avilable from 20kgs to 500kgs. Dynaspede offers the widest range of magnetic particle devices for high torque-low power applications, varying from 0.06 to 40 kgm. These torque transmitters provide stability of control of driving or braking torque, right down to zero speed. Characterised by their fast response and flat torque–speed characteristics, these devices come with matching electronics to meet your most exacting applications in textile, paper, film and foil converting industries for printing, laminating, coating processes. First introduced in India by Dynaspede in 1990, this popular range of Powder Brakes & Clutches have become today’s standards in converting industries for control of web tension. For presetting the torque levels of brakes or This controller is useful in applications like taper tension winding, or where manual setting of torque is adequate. Dynaspede presents a variety of sensors and tension monitors to cover most of the automation needs of converting or process machines. SW series of tension sensors are full bridge,strain-sensitive load cells, with built-in self-aligning bearings that make them suitable for dead shaft or live shaft applications. These are generally used in pairs to support tension-sensing idlers on either ends. Standard ratings cover a range from 10 kg to 150 kg in five sizes, adaptable for base or flange mounting. 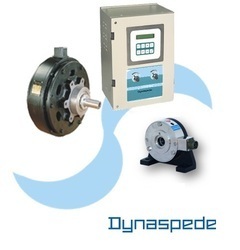 For narrow web applications, Dynaspede offers the option of using a single load cell to support one end of the sensing roll with the far end supported on anti-friction and self-aligning rolling bearings. UPB series of load cells are Under Pillow Block (UPB) assemblies, offered for ratings beyond 150 kg. Two ratings of 250 kg and 500 kg cater to most of the popular sizes for UPB series of load cells. All Dynaspede tension sensors exhibit excellent linearity and repeatability with a nominal output of 1mV/V. Signal conditioning and amplification of load cell output is included in matching digital tension monitors or controllers. We are one of the well-distinguished companies in the market that are into offering Electro-Pneumatic Brakes and Clutches. Our company has created a niche in the field of offering Safety Chuck.